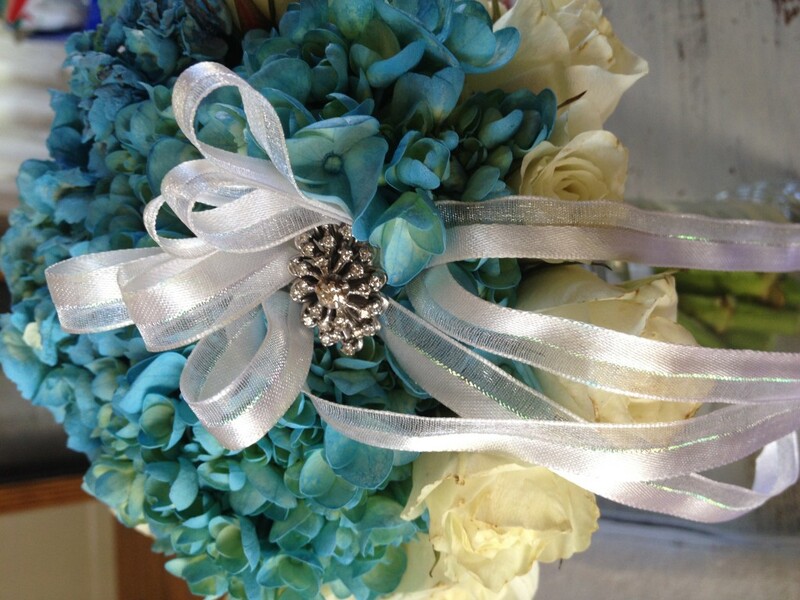 I think a bouquet is like the finishing touch for a Bride’s special day. We have seen some of the most beautiful bouquet’s over the years. Some have been very beautiful being all white flowers and some have been full of color, herbs or wildflowers. To me some of the most beautiful ones are those that make them even more sentimental with the addition of a family heirloom attached to them. There is just something that touches the heart when you add a special item that came from someone in the family that may or may not still be alive. This past week, one of the brides had this pretty bouquet. Not only did she choose an heirloom flower, but she added the special touch of her Grandmother’s beautiful diamond ring. The florist added a special ribbon in the bouquet so that we could attach the ring so it would be seen. When you plan your wedding day, and start thinking about your bouquet, think about adding a special touch like this. We have attached, a beautiful handkerchief, a small photo and other pieces of jewelry to bouquets. Making the bouquet for your wedding to honor someone in your family is a very special way of honoring that person that meant so much to you. This entry was posted in Hill Country wedding packages, Intimate Texas Weddings, Texas Elopements, Texas Weddings and tagged bride's bouquet, heirloom flowers, sentimental bouquet by admin. Bookmark the permalink.